Welcome to AbbeyBreaffy Nursing Home, our pioneering luxurious Nursing Home for the elderly, incorporating convalescent, long and short-term Nursing Home care. Ours is a purpose built single storey Nursing Home set in beautiful landscaped gardens as well as a private enclosed courtyard, with raised flowerbeds to meet the needs of our residents. At AbbeyBreaffy Nursing Home we consider our residents and their well being of primary importance. We take the internationally recognized approach of Health Promotion in Nursing Home care, a team approach, which ensures our residents and their care, are at the centre of our work and where each member of our team is equally valued. Come and visit our delightful Nursing Home - you will see the difference for yourself much better than we can ever describe it. 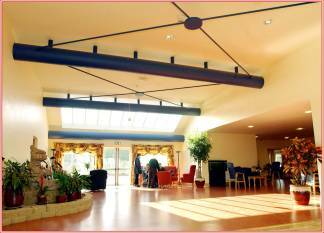 AbbeyBreaffy Nursing Home is located a mere 5 minute drive from Castlebar Town, Co. Mayo, Ireland, which has a major General Hospital. It is on the Dublin road, the N5 on the right hand side as you leave Castlebar town. A couple of hundred yards away is the fascinating new national museum of Country life which holds lots of delightful memories for older people and is used by the residents here in AbbeyBreaffy Nursing Home. In keeping with the concept of health promotion our residents are encouraged to be active and involved. Our aspiration is for everybody to be involved in interesting and meaningful activities and we will do all we can to help. There are baking facilities available for those interested and we encourage our residents to try their hand at gardening. We have live music sessions, social evenings and board games. Open reading session of the newspaper as well as poetry is just part of our activities program. Bingo is a firm favourite with our residents as well as our exercise sessions. We are planning to have our resident pet with us by the end of our first year in operation. We encourage reminiscing and all types of communication. Planned outings are regular occurrences at our nursing home. Individual Care - Every one of our residents is an individual with changing needs. Our Director of Care devises an individual care plan with each resident to ensure maximum comfort and well-being. Those who require specialised level of care are fully catered for. This includes residents with physical disability, visual impairment, acquired brain injury, Alzheimer's disease and terminal illness. A contract of care is provided for every resident detailing the level of care, facilities and relevant fees. Our nurse call systems ensure peace of mind for all residents and are standard in every room through out the nursing home. There is 24 hr nursing care and 24 hr doctor on call. Our local doctor visits the nursing home and runs a two hr clinic each week as well as attending during the week when required. The general hospital is just 5 minutes drive away with access to ambulance service when required. Treatment visit from hairdressers, chiropodists, reflexologists and other therapists can be arranged for residents. Day care facilities are provided as well as flexi-care and respite care. Visitors - We have open visiting hours and residents decide when they will see visitors. Visitors also include visiting pets and many residents avail of this facility. Visitors are encouraged to get involved in the care at AbbeyBreaffy Nursing Home and to be part of this very important aspect of their relative's lives.